In 1971 at the height of America's challenging post-60s period of change and upheaval George Jackson was killed by a guard during an escape attempt from San Quentin prison. His studies of leftist political ideas, letters to revolutionaries and writings on Marxist theories had been published in two books, Soledad Brother and Blood in My Eye and had brought him attention from similar minded anti-authority figures across the US and Europe. His founding of the Black Guerrilla Family put him in the sights of other similar groups worldwide and his willing use of weapons as an effective tool for revolutionary change ensured that he was recognised by the authorities in Cuba. 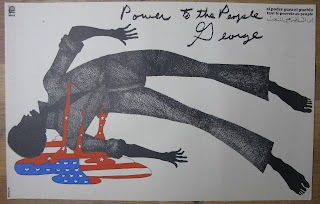 This dramatic OSPAAAL poster of 1971 by Rafael Morante is very rare. 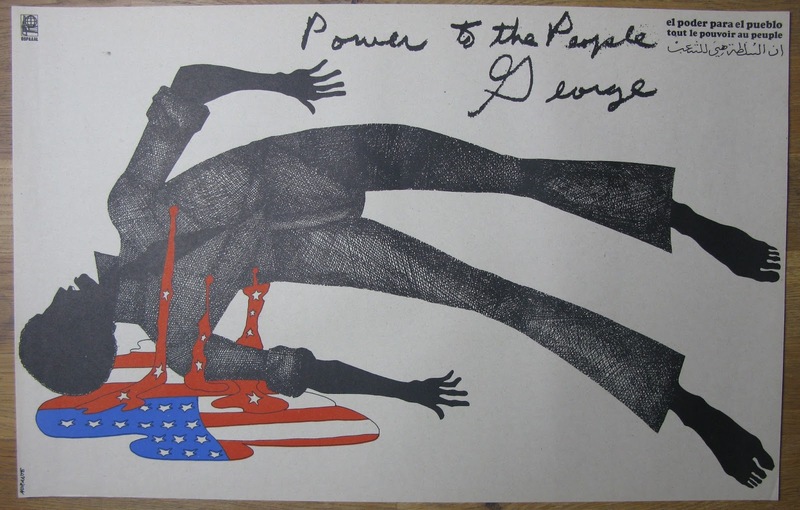 Its simple artwork implies that some element of the culture of the USA bled out of Jackson's death as his spilled blood. As with most Cuban posters of the period it is naive, and very simple in its message and design. This poster is for sale. See the sidebar for details.